I have been chasing spring these past few weeks, trying to catch up to Mother Nature’s coming out party wherever she may be making her debut. Spring has been an elusive Diva, managing to stay always a few steps ahead of me. In my wandering, I felt fortunate to spend some time where I was able to take early morning walks around a tranquil pond. The little oasis was frequented by area wildlife, including a rather large flock of Canadian geese, a family of ducks, numerous turtles, and a graceful, white egret. I have more photos than I care to count of the geese and the ducks. There are quite a few of the turtles sunning themselves, tucked close together on a fallen tree trunk. 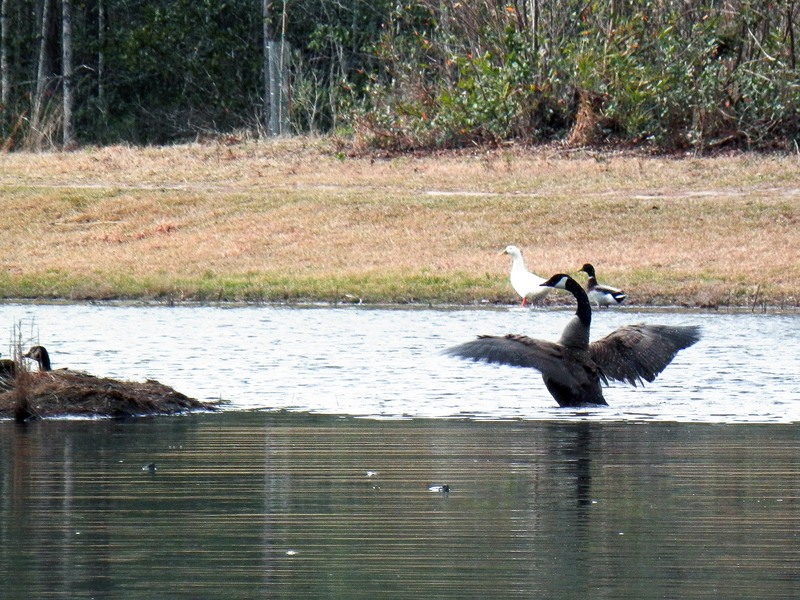 I even have several of the egret, though it was a tad camera shy. 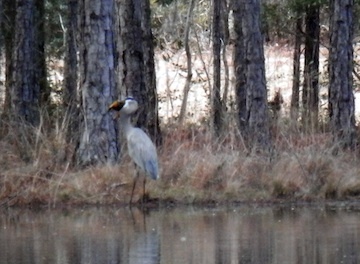 One visitor to the pond was not as easy to capture – a Great Blue Heron. I spotted him moving in the underbrush of the little island that sits in the center of the bowl, with about 50 yards of water between us. I moved along the curving rim of my shoreline, stepping slowly and as soundlessly as possible. He stepped cautiously in and out of the trees, always seeming to duck behind a broad trunk, moving out of the circle of my camera lense each time I thought I had a good shot. The best I got was this blurred image (he is holding a fish in his beak). A few days ago, I left the lodgings on the edge of the little pond to set up camp a bit further south, still seeking the sunshine and warm weather I crave. As soon as the stakes were pounded in and my lights were strung along the front of my traveling gypsy wagon I went for my customary lay-of-the-land walk. There is always much to see when walking past the compact, wheeled homes of fellow travelers, each adorned (or not) to reflect the personalities of the occupants. While I was gawking at colored lights, wind chimes, wind and sun catchers, and other yard ornaments including customary bird statuary (mostly, but not limited to, plastic flamingos) I came nearly beak to bellybutton with a very much living and breathing Great Blue Heron. After all the time spent stalking another that was clearly not ready for his close up, here was this bold bird standing right in front of me – and me without my camera! Sometimes the things we chase seem stubbornly elusive, evading our best attempts to grasp and hold tight. I have traveled from the top of the country to it’s near bottom point in my pursuit of warm, spring weather and still it eludes me – a reminder that the law of attraction might be powerful but it does not override the laws of nature. Laying the groundwork to achieve goals is all well and good. Still, we cannot forget that all things take time and sometimes we have to pause in our pursuit to let time unfold in its natural course. To everything there is a season. But, like the Blue Heron who stepped to within my arm’s reach reminds me, we must always be prepared for the opportunity when it comes knocking on our door. I’m off for my morning walk – this time with my camera. creativity in the Art of Self Expression© See you there!